Before the days of globalization, heavy industry used to build this country had to come from right here. As such, the manufacturing of steel was of the utmost importance in the late 19th century. And while steel continues to be an extremely important industry, much like the railroad industry, steel production has become much more efficient over time, making relatively small plants obsolete, which is what would happen to the Joliet Iron Works. 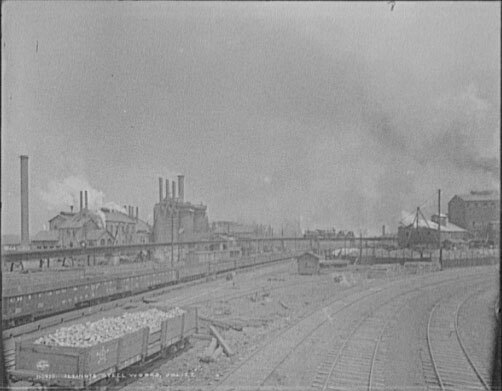 Joliet Iron Works in 1901. The mainline of the Illinois Central (now CN) ran right through it. Most of the side tracks are abandoned. One can even see this consolidation in the corporate history of the Works. The Joliet works was built by the Joliet Iron and Steel Company in 1869. Twenty years later, the Illinois Steel Company acquired it, and Illinois Steel itself was acquired by Federal Steel, which would form US Steel, which is still in business to this day. Over 4000 workers were employed at these works in 1926. The plant would continue to run amid decline until the early 1980's, sitting dormant. In 1991, the Will County Forest Preserve began acquiring parcels of the land, and built a path around the ruins, one which also connects to the I&M Heritage Corridor, due to it's proximity to the Illinois & Michigan Canal. The area was renovated in 2009, and is easy to access, if in a somewhat secluded part of downtown Joliet. Visiting early on a Saturday morning, there were few other people there, but it was far from empty. Located just off of the former Route 66 (today's IL-53) on Columbia St in Joliet. Heading north from the parking lot, you can see the ruins of an abandoned railroad line which ran over the still very active CN line. This would have connected both sides of the Works together. Walking up what's left of the bridge. There are many "KEEP OFF" signs throughout the park, and it's not hard to figure out why when dealing with ruins. Tons of signs dominate the area, explaining the history and significance of the individual parts of the site. From how many abandoned railroads are in IL, and PA, this is not surprising. On the other side of the tracks, more abandoned but inaccessible buildings lay dormant. I wonder if there'll ever be an opportunity to visit those! Another building. Graffiti was rampant on that side. It should be noted that these buildings are immediately south of the Old Joliet Prison. Back to the actual ruins here though, the trail diverges here between the I&M canal trail and the walk through the ruins. The Works would be part of the Great Steel Strike of 1919. This is one part of the ruins that is easier to see from the I&M Canal Trail than the actual walking tour. The stoves are the largest ruin, much to explore here, more so if you're adventurous enough to ignore the KEEP OUT signs and peek inside. More piers for a railroad bridge to connect both sites above the tracks. This ramp was one of the few ruins that you could walk on. Below the ramp. Hard to imagine these arches are only about 150 years old! Some graffiti in the ruins below. If you're near the area, there are few places which give such a unique perspective on local history. What many would see as blight is so much more. It is definitely worth seeing for yourself. This is the story of a small part of the creation of the World as we know it, as both the steel industry and the railroad industry were codependent on each other, as was society for being able to create larger and larger skyscrapers, and the cities we've grown accustomed to today. As always, thanks for reading! Railroads, in their early days were a significant force in geopolitics. This continues even today, as countries and regions vie for influence in today's globalized world. An admittedly small, but nonetheless, a part of North & South Korea's conflict involves connecting the two countries together via the railroad. However, the railroad industry has actually built countries, and not in the physical sense, where a railroad builds cities and towns along it's route, but were actually responsible for developing a national identity and connectivity. Canada, with it's extremely large and spread out population, partially owes it's existence as a single transcontinental country to railroads. It is possible, if not likely, that Canada would look a lot differently today politically were it not for the railroads. 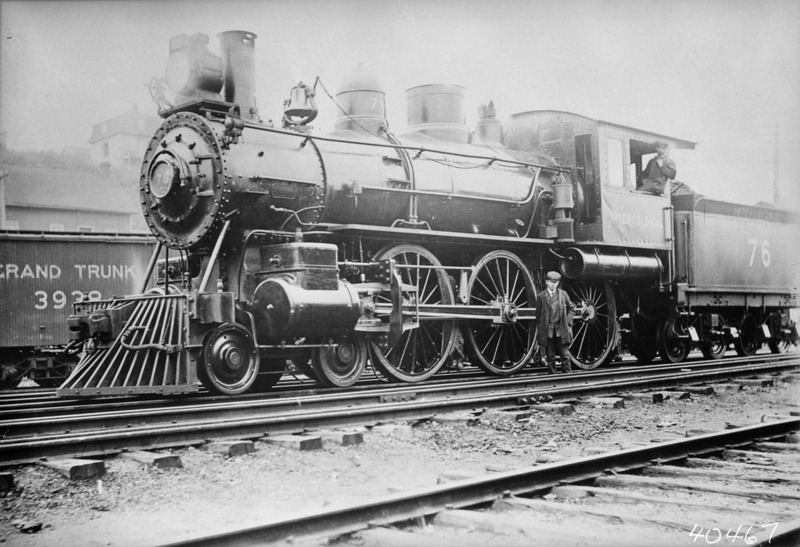 The Guarantee Act of 1849 ensured that any railroad investment in Canada would yield returns on their bonds. Of course, while the Act indeed spurred railroad development, it also led to an oversaturation of the market, and the creation of many unprofitable lines, as returns were backed by the government. A nearly bankrupt country would end the Guarantee Act in 1860, after financing the Grand Trunk Railway, linking Montreal with Sarnia, ON. But there were still vast swaths of the continent which needed rail service, as at this time, Canada was not yet a confederation. In an attempt to strengthen ties to the Maritime Colonies, the Intercolonial Railway was built, by the Canadian government as opposed to financiers, like in the early days. 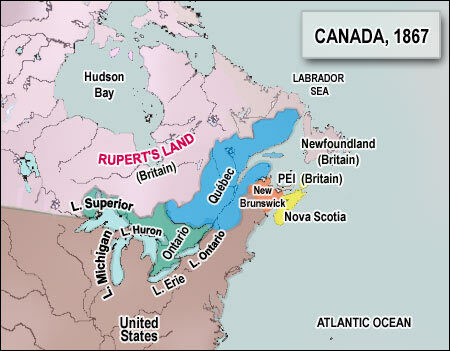 This line connected Nova Scotia with Canada, strengthening ties between the two, and was thus a driving factor in Canada's confederation, which occurred in 1867. The Intercolonial Railway was in service until 1918, when it was consolidated into another government built corporation, Canadian National Railways. 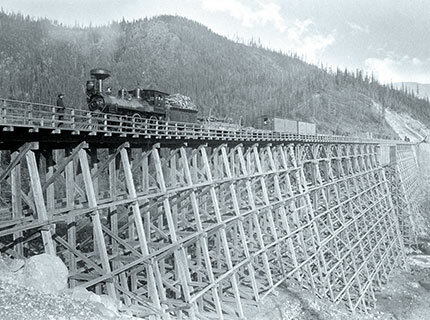 The success of the railroad in connecting and Confederating Eastern Canada would be replicated with British Columbia's entrance into Confederation in 1871, under promise of a line being built, connecting the Pacific with Eastern Canada. This promise of a railroad would be fulfilled 10 years later, with the opening of the Canadian Pacific Railway, which has grown to be one of the largest railroads in North America. Canadian Pacific is one of only seven remaining Class I freight railroads in the US, and one of two in Canada. Much as the railroads in the United States helped establish a national identity, and allowed for people to travel and communicate in ways hitherto unthinkable, the same was true in Canada. In addition to bringing people hundreds (if not thousands) of miles apart together in a unified identity, the railroads were also a vital resource in the war effort for the Allies in both World Wars, as both the US and Canada were able to transport troops, weapons, and supplies from battalions to ships across the continent. View from Goldmine Rd, west of Pearl City, IL, along the abandoned CGW right-of-way. Other than a small Canadian National Railway operation near DuPage Airport, a few industrial customers for Union Pacific between Tyler Rd and Kautz Rd in St. Charles, and a small operation serving the power plant in Byron, the entirety of the 147 mile former Chicago Great Western Railway line between Forest Park and Galena Jct is abandoned, making it the longest abandonment from Chicago by far. The line extended from Chicago, on trackage which now leads to the Union Pacific Global 1 yard, and then followed a line immediately north of where the current Forest Park CTA station is today, paralleling the Chicago Aurora & Elgin Interurban Railroad, which itself is abandoned. But before we see what the line looks like today, let's examine Chicago Great Western's history. The Chicago Great Western was one of the last Class I railroads, and as such, competing lines often had an advantage with regard to track location. The business was thus modeled with efficiency in mind in an effort to stay afloat, using only one set of crews, and pulling very long freight trains. The line to Chicago began construction in 1886. This right-of-way actually had origins in the 1830's, as the Chicago St. Charles & Mississippi Airline Railroad was chartered, but never built. 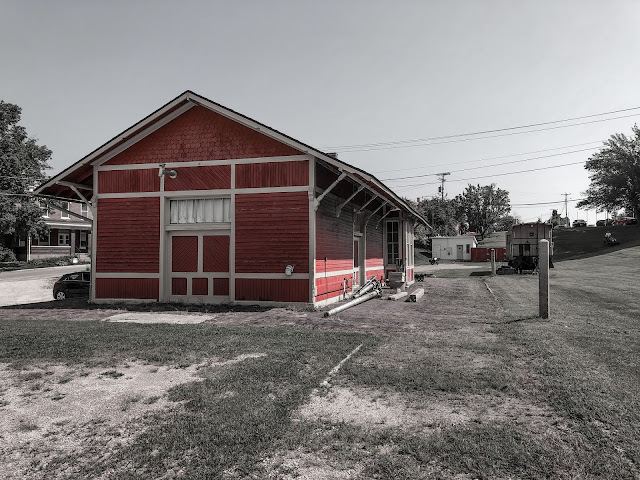 The rights were transferred to the Minnesota & Northwestern Railroad in the 1850's, who eventually got around to using the rights to build the road in 1884. Wanting to have Chicago in it's name, by 1892, the Minnesota & Northwestern reorganized as the Chicago Great Western Railway, although it was headquartered in Oelwein, IA. 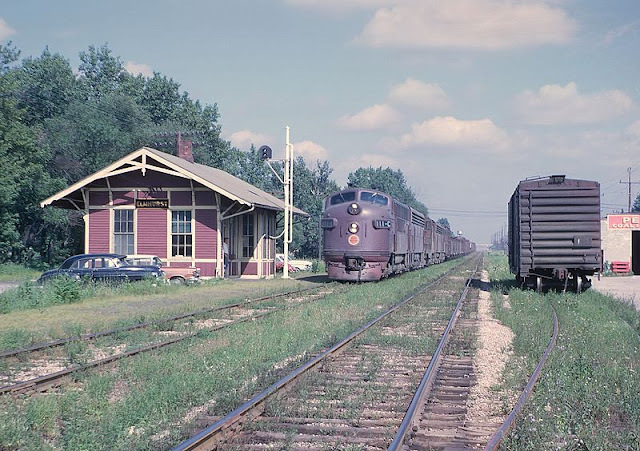 Chicago Great Western would merge with the Chicago & Northwestern Railway in 1968, who would begin the process of abandoning the line piecemeal. The CNW was itself merged into Union Pacific in 1995, who would abandon or put out of service much of the rest of the route. The Illinois Prairie Path begins west of the parking lot for the Forest Park CTA, using the rights-of-way of the abandoned Chicago Aurora & Elgin and Chicago Great Western lines. Looking west at the beginning of the Illinois Prairie Path. Notice cemeteries on either side of the trail. The two railroads diverged in Villa Park. The CGW took a more northwesterly path, through was at one time the headquarters for the Ovaltine company, which made cocoa powder. Today, the factory grounds are condominiums. West of Villa Ave, the Great Western Trail begins. The Great Western Trail continues along the right-of-way until IL-59 in West Chicago. The Chicago Great Western right-of-way was quite duplicitous for the Chicago & Northwestern, as it passed through the very active UP-West line, which traces it's origin to the CNW as well. That the trail passes over this line, it makes for some great railfanning opportunities, and is partly why I love rail trails so much. You can watch trains all day in Lombard if you want, just like you can on the Prairie Path in Wheaton. The path in an early January thaw, the trail was quite busy that day. Crossing Swift Rd, looking east. I-355 was constructed after the CGW was abandoned, going under the former ROW. Bridge built in 2000 over a creek east of Prince Crossing Rd. The Chicago Great Western crossed the Chicago Aurora & Elgin Railroad just west of Prince Crossing Rd. There are many abandoned telegraph poles on the south side of the ROW. here, albeit as an industrial spur instead of the mainline. The Great Western right-of-way ran right through where DuPage Airport currently is today. Past Tyler Rd, the right-of-way is still owned by Union Pacific, but the rails were torn up in 2011-ish, including the bridge over the Fox River in St. Charles. The bridge is (currently) not part of the Great Western Trail, and is still owned by Union Pacific. Trail users use a pedestrian bridge right next to the line. It wouldn't be terribly difficult to trespass on the bridge, but I never would do that. Another shot of the pedestrian bridge over the Fox. The Great Western Trail uses the right-of-way again starting at Peck Rd west of the Fox, continuing all the way to Sycamore. Looking west at Hanson Rd near Lily Lake. Near Lily Lake, old telegraph poles can be found adjacent to the trail. Former bridge piers along the ROW at IL-47. The sun was bright, and the shade was welcome when I walked this trail! Looking east at the Great Western Trail's western beginning in Sycamore at Old State Rd. While the trail ends, the right-of-way continues all the way to Galena Junction, IL. Another abandoned line begins in Dubuque, IA and extends all the way to Oelwein, completing the former CGW mainline from Chicago to Oelwein. I managed to get some pics in Western Illinois, although I don't have perspectives between west of Sycamore and east of Kent. Looking west at the right-of-way next to an industrial park in Sycamore. The right-of-way looking east from IL-73 in Pearl City. In Stockton, IL, the Great Western Hotel was adjacent to the right-of-way. Today it appears to be simply an apartment complex. Looking east at the museum. I was hoping to visit the Elizabeth museum, but unfortunately, they are only open on weekends, and I visited on a Friday morning. 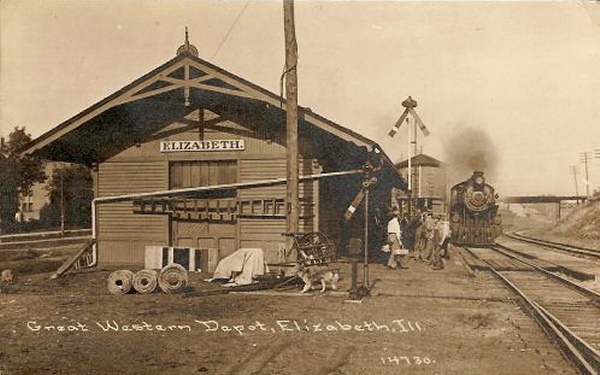 A farmer's co-op is located where the right-of-way once was in Elizabeth. The museum has a Milwaukee Road caboose on display. This is a mile-marker using distance from Chicago. It didn't come from Elizabeth, as that's about 135 miles from the City. MILW-2034 sits at the museum. Well, the sign is pretty at the very least. West of Stockton, IL, the line traversed some of the most rugged terrain in Illinois, which isn't saying much, but the topography of Jo Daviess County, IL is quite hilly. The railroad actually used a tunnel, called the Winston Tunnel, to traverse near the line's west end. The line's western end is at what once was Chicago Burlington & Quincy right-of-way (today's BNSF Railway). The CGW used the same right of way, crossing the Mississippi River into Dubuque, where the lines diverged. A 26 mile long rail-trail uses this right-of-way between Dubuque and Dyersville, IA as the Heritage Trail. Looking northeast from Burton's Furnace Rd in Durango. Bridge over Little Maquoketa River in Durango. The abandoned line from Dubuque continued all the way to Oelwein, one of Iowa's many abandoned railroad lines, adding another 73 miles of abandoned right of way. As always, I hope you enjoyed today's blog, and thanks for reading!